This is a design and build new house on a small lot which has been created from a sub-division of a larger site. The challenge was to design and build a generous contemporary upmarket family home on a significantly small lot – 305m2 that was subject to Traditional Character Overlay design requirements. 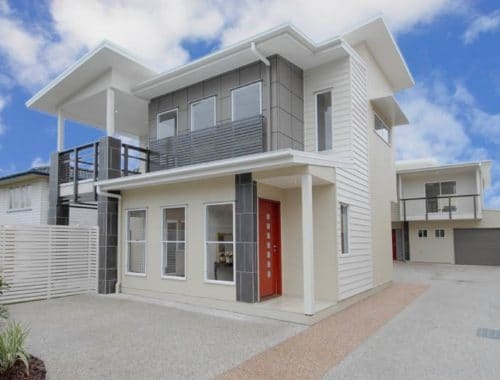 The style of house is a lightweight contemporary modern home with bold aesthetics and value engineered structure. The façade was designed and constructed with the clever use of attractive geometric shapes and forms, coupled with the mixed use of external cladding materials, feature elements and colours giving the home its ‘Wow-Factor’ street appeal. 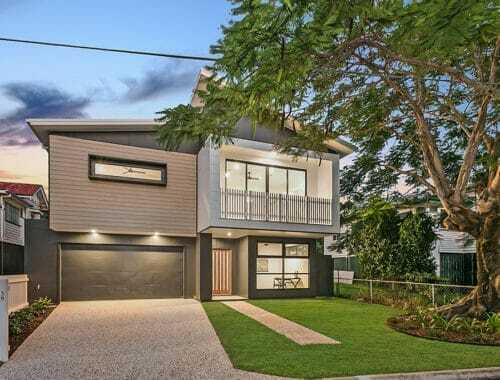 The home has been designed and built to cater for the Brisbane subtropical lifestyle; it incorporates expansive living and low maintenance and is ideal for entertaining. It has been built to suit the client’s needs and lifestyle both now and to adapt to the potential evolving dynamics of the occupants in the future, with the possibility of repurposing rooms. The most striking element of the house is the clever layout and the generous proportions allotted to the various areas and/or rooms, given how small the property is (305m2).